This message was preached by Colin D'cruz at Word of Grace Church on March 18th, 2018. To listen/download the audio please click here. To listen to the Sunday's worship and prophetic contributions please click here. This is happening at the end of time. Time is linear and it started in eternity past and one day Jesus will come back. Books were open- there were 2 sets of books- one was the book of life and there were other books. Every time we say something, think or do something, God records it in these books. Like in a court of law, it will be read out. It will not be like any court on earth where justice is perverted. God cannot be cheated. If you have trusted in Jesus, this judgment is not for you. That is the Good News! If you have believed in Jesus as God who rose from the dead our name is written in the Book of Life. 2 Corinthians 5:10- “For we must all appear before the judgment seat of Christ, so that each of us may receive what is due us for the things done while in the body, whether good or bad.” Here Paul is addressing believers. We have another judgement. We must all appear before Christ. There are different judgements- Judgement of the believer and the judgment of the unbeliever. 1. The great white throne Judgement is not for us. If there is anyone who has not put their trust in Jesus, today is the day of Salvation. No one comes to the Father except through Him. 2. For those who have put their trust in Him, God has justified us. The righteousness of Jesus is credited to us. We are going to heaven because of what Jesus has done. 3. We still cannot live any which way we want to... we make it our desire to please God. God’s love for us is unconditional. But we can please him or displease him by how we live. 2 Corinthians 5:9 “So we make it our goal to please him, whether we are at home in the body or away from it”. Colossians 1:10 “so that you may live a life worthy of the Lord and please him in every way: bearing fruit in every good work, growing in the knowledge of God”. At the end of our lives when Jesus comes, He said Revelation 22: 12 ““Look, I am coming soon! My reward is with me, and I will give to each person according to what they have done.” Our salvation is free. But our rewards are given according to what we have done. We don’t like that word- Judgement- because we are fearful of what we have done. It is not a judging of our sins. Our sins have been judged on the cross. But this is like an appraisal and evaluation. He is going to evaluate and give bonus’ to everyone who has worked. The word of this Judgement seat “bima” is taken from the victory stand at athletics. The Good News is that we will all get our turn. Everyone will be rewarded. God wants to bless us, so we will stand before this judgement seat of Christ- not to bring up our sin, it is dealt with, but to reward us for the good things we do in obedience. Q. If the next 24 hours of your life will determine the next 100 years, how would you live? There are 2 kinds of Christians- baby Christians and mature Christians. Baby Christians are worldly, and can’t handle solid food. Paul is asking them to be united because we are all God’s fellow workers and have a role to play. Each will be rewarded. The foundation in a believers’ life is laid and each one has to be careful how he builds. The foundation of our Christian walk is Jesus. Now we have a responsibility to build well. You are saved. Now God says, build on what I have given you. Different measure has been given to each of us. It will be revealed with fire. In our lives, that is what is going to happen. At the judgment seat, how we lived our lives will be tested by fire. How we live our lives is being recorded. As we live, we are building a house. On that day, if it is burnt up, we will escape from the house just as one escaping the fire. Paul is encouraging them to live in such a way that we will get rewards. This is the final exam. One day our lives will be evaluated. God will judge not just our deeds but the motives of their hearts. We may even do good things, but if the motive is wrong, it is burnt up. We want to live in such a way that we are building with gold, silver and precious stones. When we stand before that throne, there is going to be a fair judgement. We will be individually judged. Q. Have you faced injustice? When that happens, you are blessed, because our rewards will be great in heaven. We need to keep our perspective. 2. Hospitality- we can have friends who are similar to us. We invite them and enjoy each others company. But invite those who cannot repay you back. When you do that, you will be repaid at the resurrection of the righteous. It is so important to extend hospitality to those who cannot repay you. Even a cup of cold water, a meal, will give you eternal reward. 3. We maybe in a situation where you are not being recognised and rewarded justly. Colossians 3:23-24 “Whatever you do, work at it with all your heart, as working for the Lord, not for human masters, 24 since you know that you will receive an inheritance from the Lord as a reward. It is the Lord Christ you are serving.” You work faithfully for a horrible boss and do your job well. You may not be rewarded in the company, but one day before the judgement seat of Christ, you will be rewarded. Q. How did Paul live in view of all this? The Christian life is not a cake walk, it is a race. It is a thing of endurance. We have to put in effort. We have to train- not try. 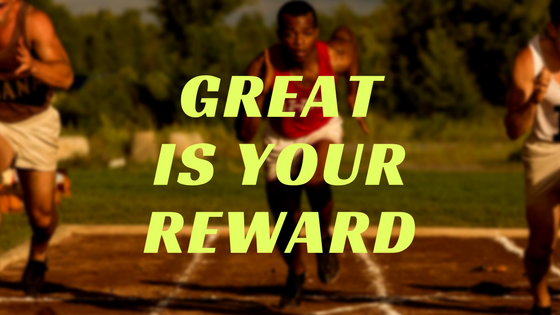 You will not lose your reward. For those who are weary and tires, do not lose heart. 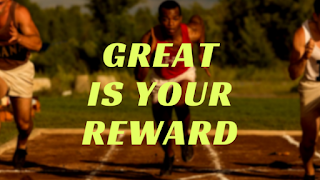 If we persevere, we will receive a reward. I pray that our mind will be changed and we look at every opportunity to gain this reward. Let’s pray.